Nothing gives a home more soul than an interesting art collection. Many designers look for inspiration from a beautiful rug or fabric though most would admit it’s a dream to start a project with wonderful art. 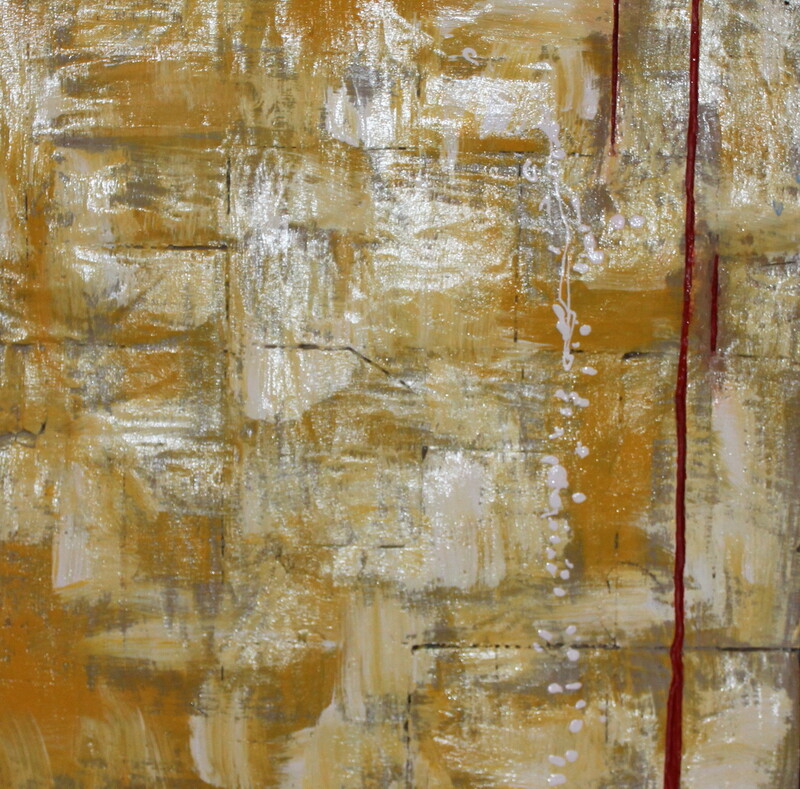 I love to pair abstract art with clean lined antiques –the contrast always works. I recently discovered Richard Brightling’s work and wanted to share it with you. Architectural sales consultant Richard Brightling has been moonlighting for years. 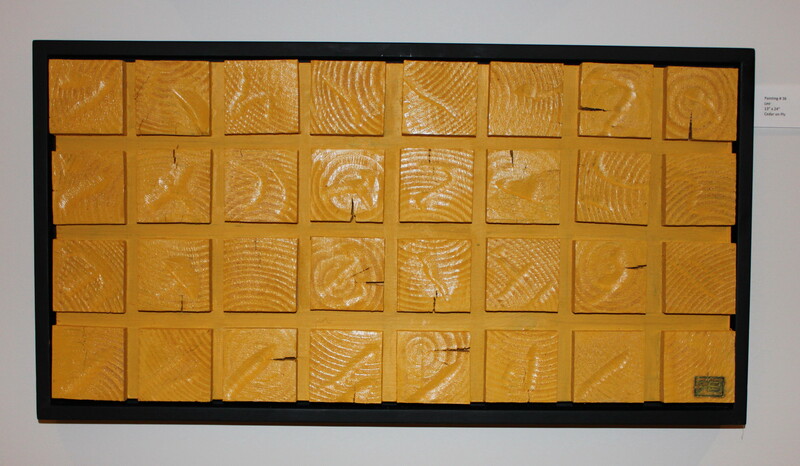 In his backyard workroom, he transforms scrap pieces of wood into striking works of abstract art. A native of the UK, he took an early interest in art, architecture, design and woodworking. While he studied advertising at college, he also took courses in art and sculpting. 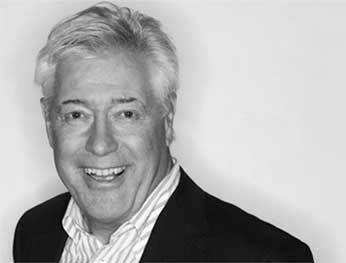 In 1967, Richard immigrated to Canada and built a career in marketing and advertising. He held key positions for Hayhurst (now Saatchi and Saatchi), JWT and Vickers and Benson before starting his own agency and three more communications companies. He still devotes most of his time to consulting, though his workshop is never far from his mind. 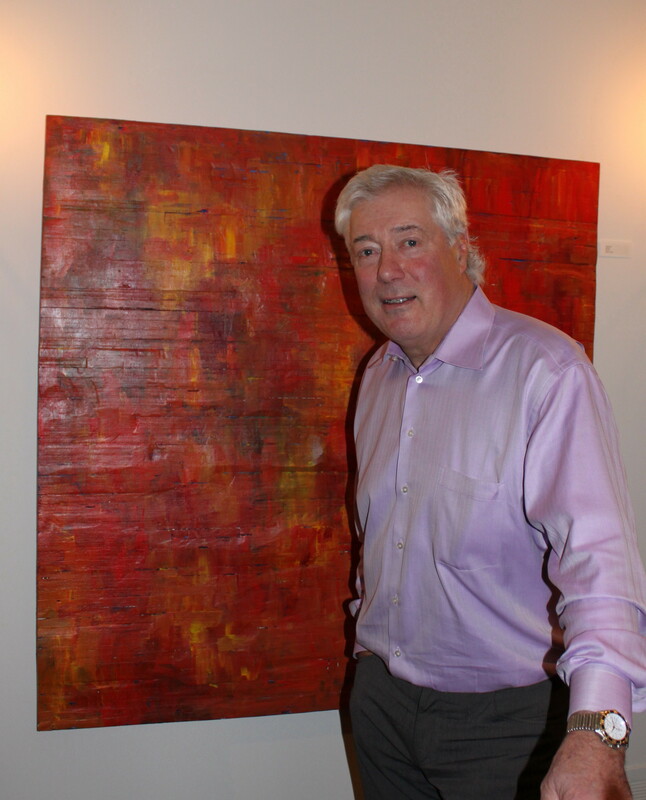 Richard recently hosted a two-day exhibition of his latest paintings on wood – 43 works in all. He was overwhelmed by the response to his work. 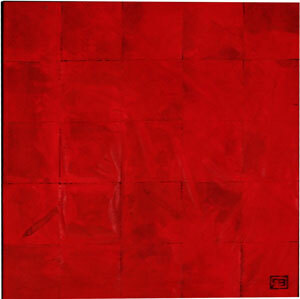 Sixty percent of his pieces were sold over two days. 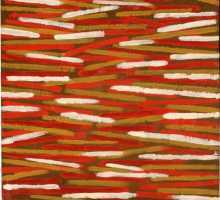 While he’s spent many years as a fine carpenter and furniture maker, the charismatic artist only took up painting in 2007. 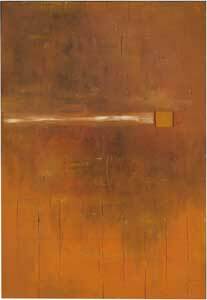 Several courses at the Art Gallery of Ontario led to his current interest in abstract art. He says, “I realized every tree and landscape in Canada had already been painted.” So he turned to one of his great loves – wood. 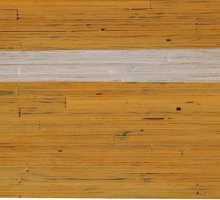 His unique approach to the medium involves an application of paint on prepared wood surfaces cut from end grain stock, originating from Douglas Fir, Cedar and Plywood. 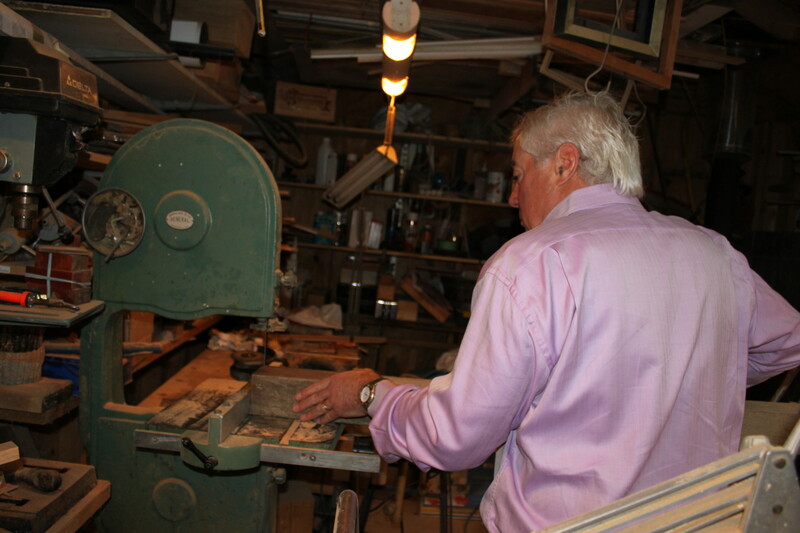 Here in his workshop, Richard demonstrates how he cuts recycled wood to produce his art. 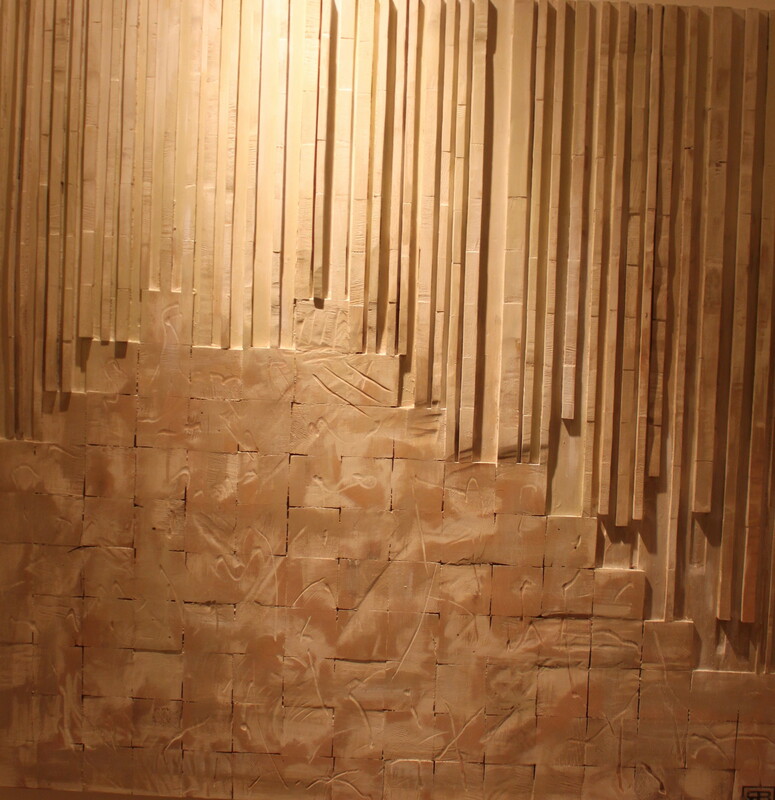 His technique creates a unique textural surface. 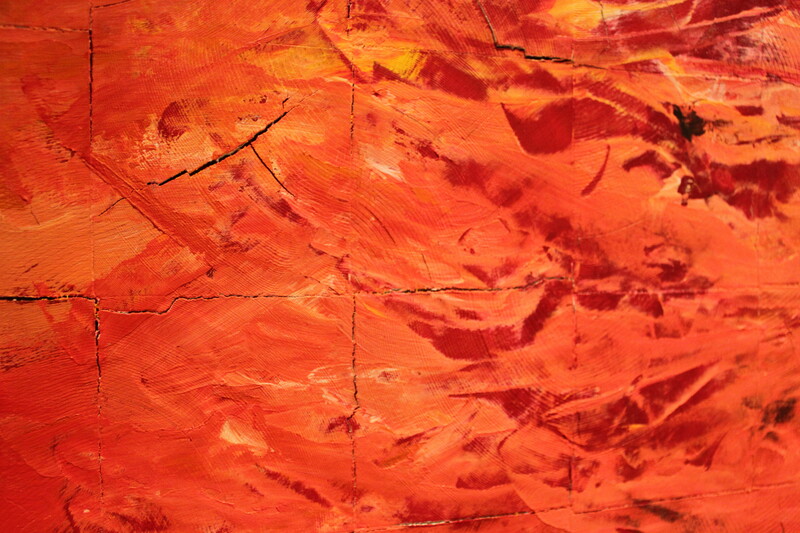 A close-up of one of Richard’s paintings shows the detail of the wood grain. 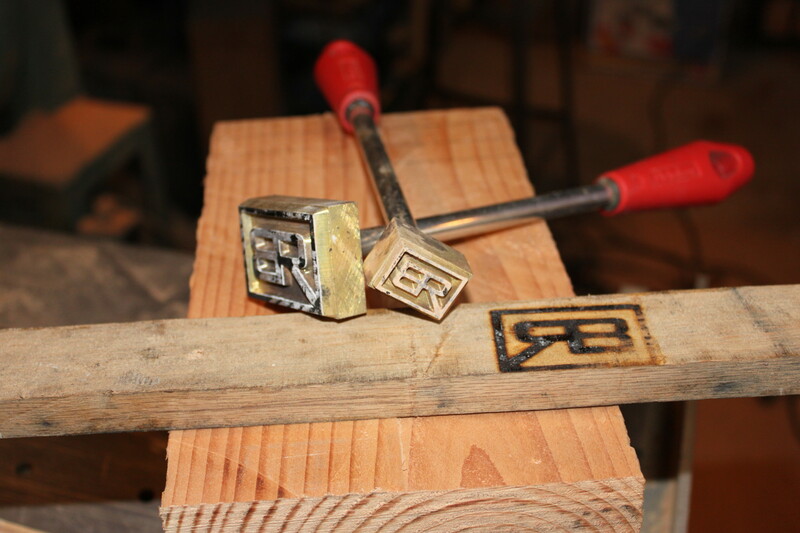 He sear brands each piece with his RB signature. Richard has developed a three-part process to create his art. It starts with the preparation of a frame to hold the individually cut pieces of end grain wood. These pieces are applied to the frame’s surface which is then sculpted, sanded and gouged to create abstract patterns and shapes. 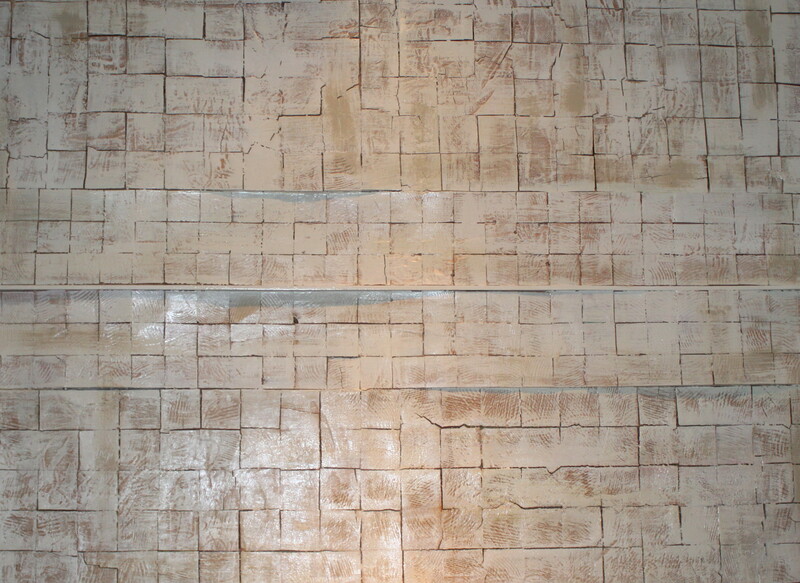 Finally, thin layers of paint and stain are applied to the surface to produce each image. All the wood comes from scrap sources. 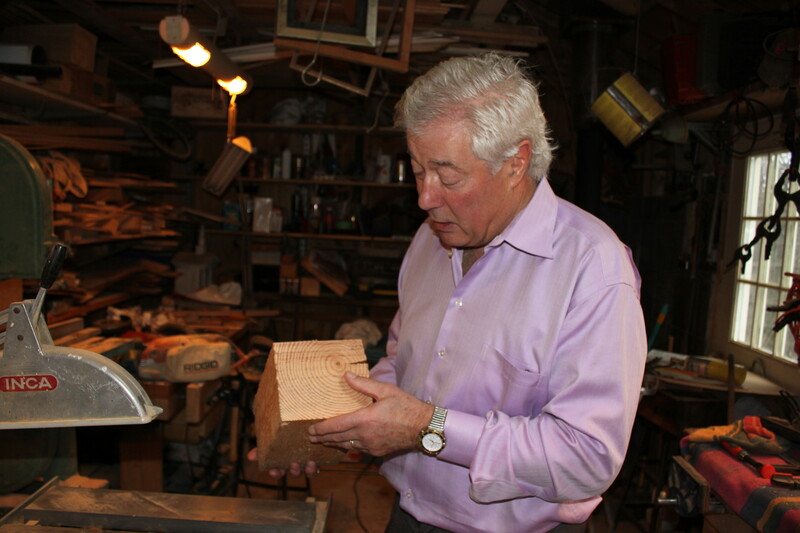 The artist explains, “To me, discarded wood in its many forms is beautiful. I believe my work gives trees a third life.” In a way, he credits our disposable society for allowing him to use recycled wood — he in turn gives it a new life. 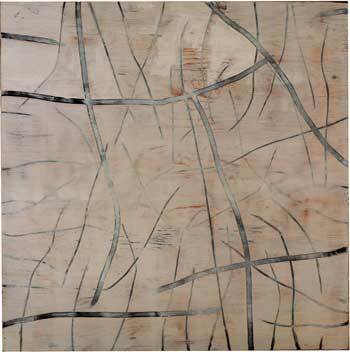 These paintings, featured in his latest show, are rich in texture. 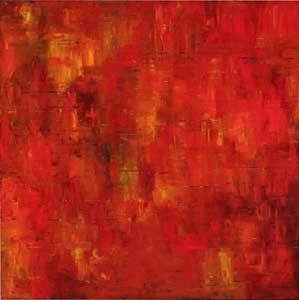 Much of Richard’s work features a warm palette of reds, oranges and yellows. 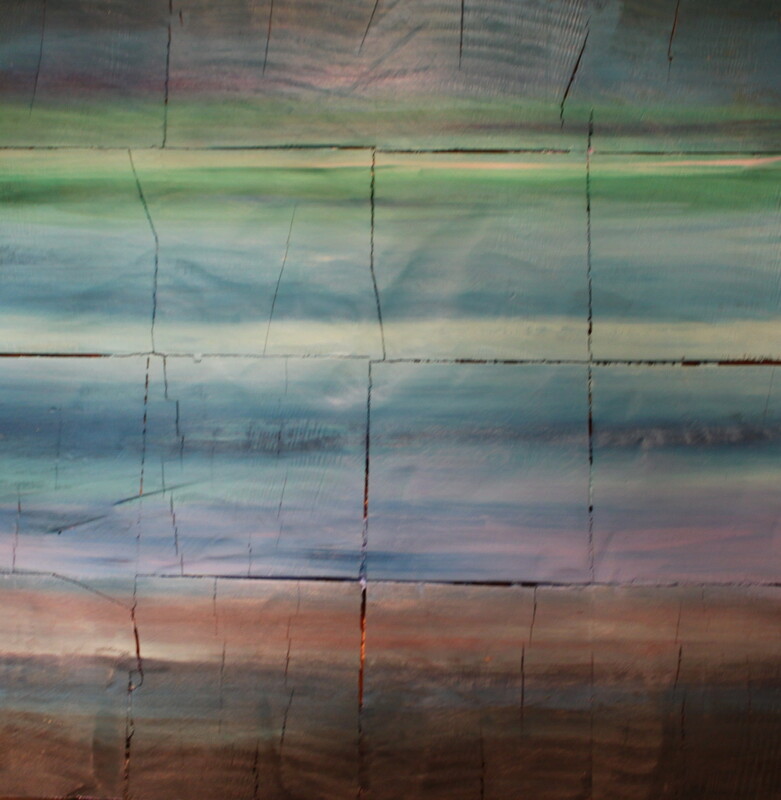 Although many of his paintings are spoken for, the artist will be busy this winter creating more work. To find out more about Richard Brightling’s artwork or commission a painting, check out his website here or email him here.